Following the initial low, then a retest, price pulls back to offer us a 3-swing-retracement entry short (also could just as well be considered an upthrust). 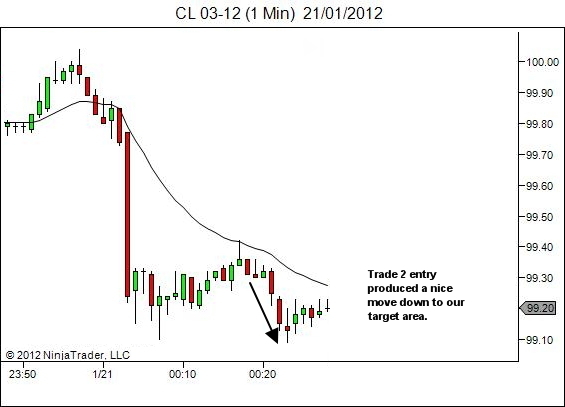 (Chart Info: Crude Oil, 20 Jan 2012, 1-min chart; although the concept discussed in this article applies to all markets and all timeframes. Timeframes used for the trade were 1-min and less (YTC Scalper timeframes) although the trade decision making and management in this instance were pure YTC Price Action Trader, not YTC Scalper). Let's assume though that we pass on this entry, awaiting a better trap if one set up. We're rewarded just three minutes later with another entry. 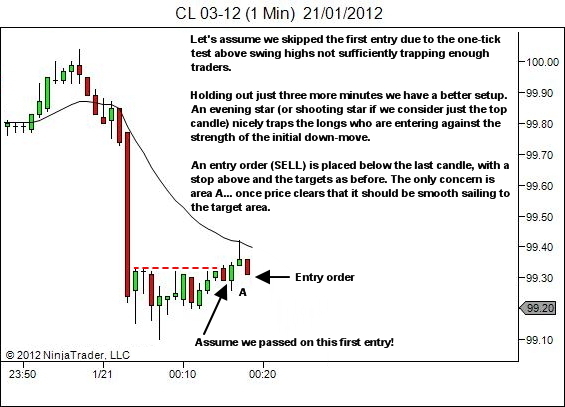 Price has again set up a valid trap and offered us a nice entry opportunity short. In my opinion, an even better entry opportunity than the first. You don't know that price is going to offer another opportunity if you pass on the first trade. It's quite possible that the first trade could have worked. How would you feel watching another massive leg to the downside, equivalent to the 80-tick leg down from the session open? So should you take the first trade? But then what if it stops out (as did happen here)? Will you then have the courage to enter the second (and better) setup following the first loss, or will the fear of two losses in a row cause you to hesitate and miss a potential move lower? This is the real game. Learning the setups is the easy part. Learning to trade is MUCH harder! Amateurs will tell you that you need to trade like a machine. Trade without emotion! Take all the setups and let your edge work for you! Rubbish. You are not a machine. You cannot ignore your fear. You cannot just "take all the setups". If you don't believe me… try it. Fear will influence your decision making leading to inconsistent application of your trading plan, creating the losses that you so desperately want to avoid. And this will continue for as long as you perceive trade losses to be a bad thing. Logically you may accept that losses are a part of the business. In reality though, you continue to fear the uncertainty of outcomes that exist at the right hand side of your charts. Welcome to the real challenge… learning to operate within an environment of uncertainty. You don't know what will happen when you enter. You can never know. Let's look at a lower timeframe to see the "internal" workings of the price movement in the two trades (because I took both trades 1 and 2). Trade 1 was of course a loss. 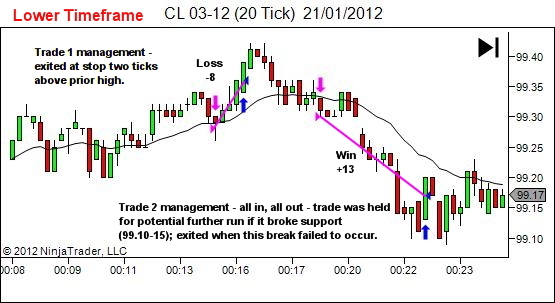 Trade 2 was held for the attempt at a break to new session lows; scratched when it was clear that was not going to break on the first attempt. This is the REAL challenge of trading… learning to operate within an environment of uncertainty. Learning to act decisively despite the fact that you cannot know with certainty what is coming next. So… what should a trader do? Improve the likelihood of better decisions through operating only with your mind and body in optimal condition. Get fit and healthy. Get sufficient sleep. And learn to relax. 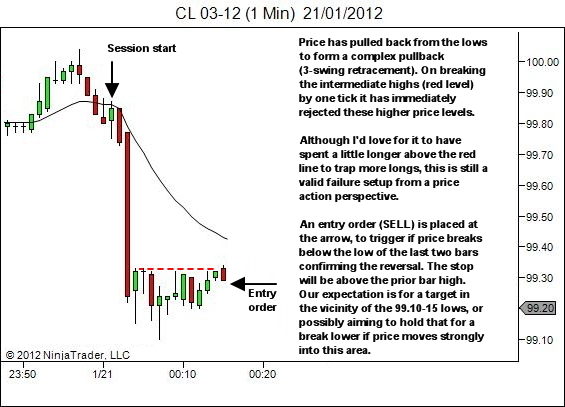 Be clear about your trading plan and your pre, during and post-session routines and procedures. Internalise them as much as possible for during-session. Monitor your thoughts while trading. Learn to recognise when fear is a factor in your decision making. If trade 1 above was avoided because you were not satisfied with the trap and felt the bulls had another push in them before giving up, then that's an acceptable decision. But if you skipped trade 1 because yesterday produced a losing session and you're just a bit hesitant to get in…. then that's an indication that you have some fear issues and need to work on your trading psych. If you skipped trade 2 because you took a loss on trade 1 and just couldn't face two in a row, then once again you've got a problem and have a bit of work to do (assuming your plan doesn't rule out re-entry). While trading, take note in your journal of any occurrences of fear-influenced decision making. And spend some time examining this fear post-session in order to identify the underlying issues and root-cause.The markets are a mirror that project back to us all our fears, hopes and desires. Recognise them for what they are – a part of you. And seize the opportunity that the markets offer for personal growth.Learn to work with your fears rather than trying to fight them or avoid them. Manage risk… because you're always going to make mistakes. Learn to forgive yourself for these mistakes. And be sure to implement a thorough process of deliberate practice; because trading success is a process of learning and growth over time. Technical analysis and strategy can be taught in a weekend. Learning to trade is going to take a while longer. Learn to enjoy the process.Embrace the uncertainty! Enjoy the challenge! This really hits home on being able to manage your fear and emotions. You have said more in 1 page than “trading psychologists” have said in 300 pages. Great article Lance. Answers several of my queries to you. Fear is the key and we have to unlock it. As i read your article, i can visualise my market sessions right in front of my eyes. This article is such an eye opener when you say “This is the real game. Learning the setups is the easy part. Learning to trade is MUCH harder! how true. Great one Lance pls keep posting. I agree with others, and just want to take the time to thank you again for all the awesome material you’ve written. It’s greatly appreciated because it’s a no BS view and approach to the markets.